Did you ever wonder what hands you should be playing preflop? 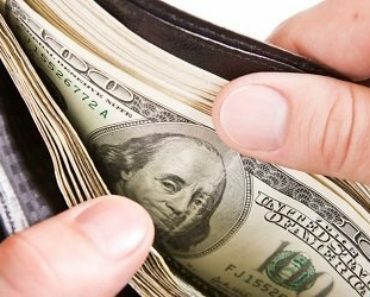 Or ask yourself: Is this hand a profitable open raise? Or should it be just mucked? I used to ask the very same questions too until I did this little exercise called ‘poker range construction’; more specifically preflop range construction. 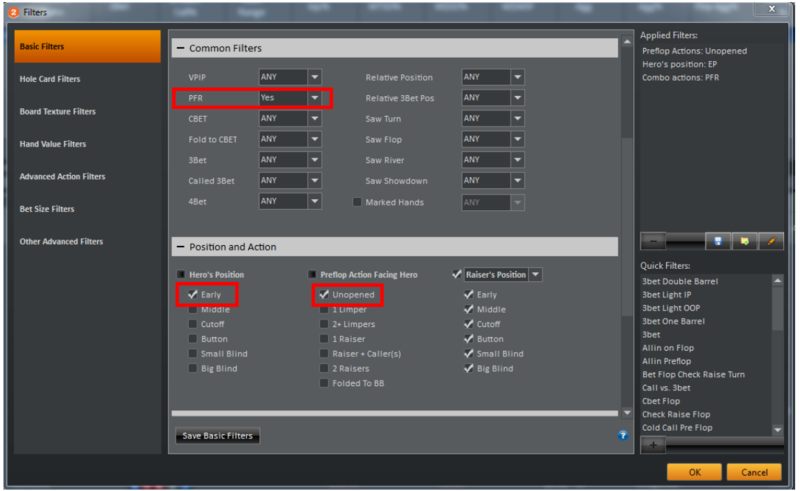 In this post, we will answer these questions and remove the ‘guesswork‘ from your preflop poker game. Knowing what hands to play preflop is key to your poker success! The hands you play preflop are the starting point of your game. A poor preflop strategy is like building a house on quicksand – you will go nowhere quickly. There is a very good reason engineers dig a deep hole when building skyscrapers – you need a solid foundation. The same applies to poker and preflop is the foundation of your game. Plus preflop is where you make most of your poker decisions, so it’s worthwhile investing time to get it right! It’s not a very complicated process when broken down into the short steps below. So sit tight and prepare to learn a thing or two. I am going to show you the process I use to construct my preflop opening ranges for 6max, and I will give you the final ranges (free downloads). After reading, you should do this task yourself and modify the ranges to suit your style of play, the games you play and your skill level. 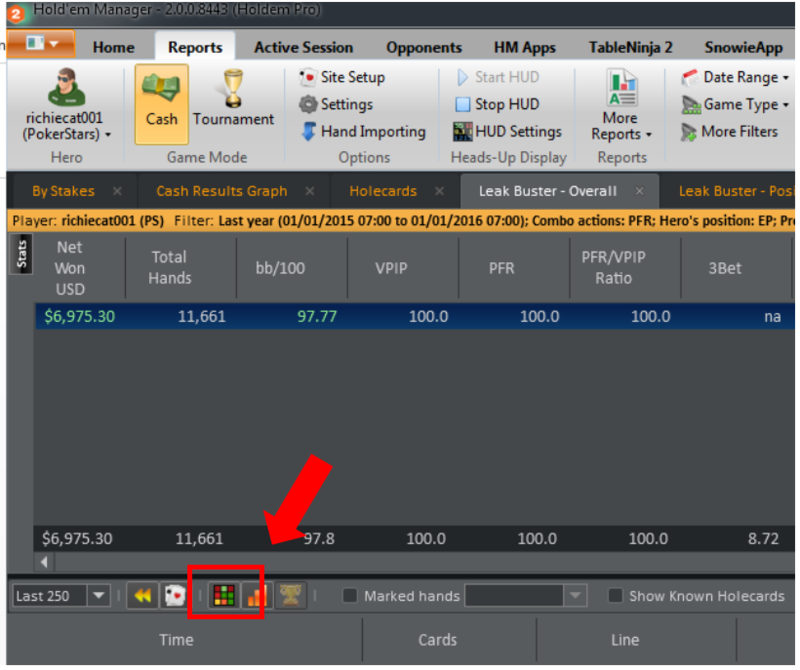 We will need to use a poker tracker for this exercise, so if you don’t have one, I would recommend Hold’em Manager 2. HEM is the poker tracker I use in this post and has a 30-day free trial. If you have played lots of hands online and don’t have them stored on your computer, you can request to download the history from your poker room. Although you may need to email them. If you don’t have any hand database at all – follow along, see the process and use the ranges I provide as a start which you can modify later. For displaying and saving the ranges, I use Flopzilla (which I would recommend for any semi-serious poker player). Flopzilla is a tool which allows you to create and store ranges (really handy for this exercise). 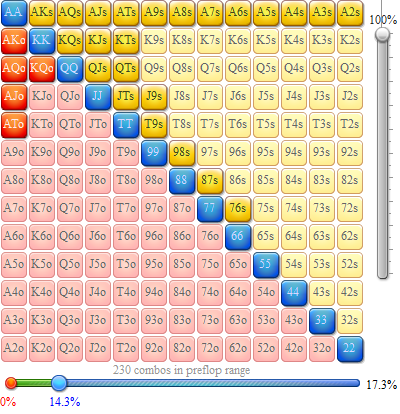 Then allows you to see how the ranges interact with particular flop textures. For more on Flopzilla check out this video. Flopzilla also has an equity calculator (by the same developer) which links directly up with Flopzilla (very handy). Check out the video tutorial and get the free download here. Flopzilla can also be used to display ranges in the same way, but unfortunately, it cannot save them. 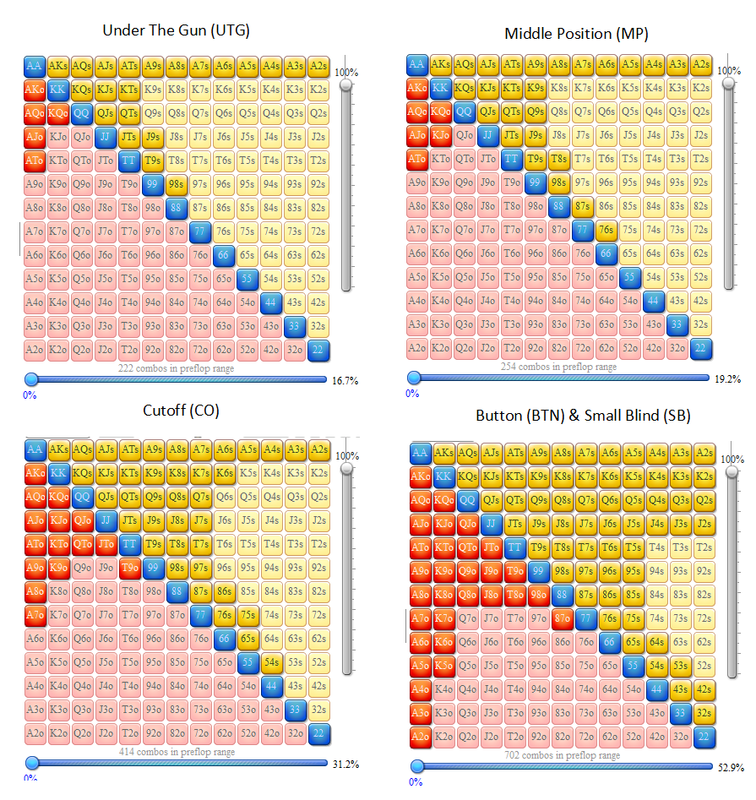 Estimate the ranges from each position (UTG, MP, CO, etc.) based on what you assume to be most profitable (first guess). 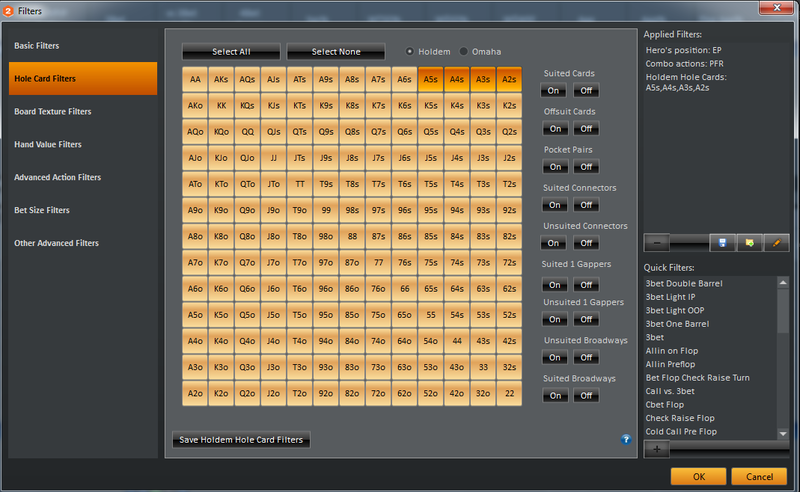 Determine the hands you can profitably play from each position using a poker tracker. Use the excel sheet provided to determine what hands are profitable and use that to change your ranges. Apply any finishing touches and write down any noteworthy changes to your range you need to remember in-game. The excel sheet is a large database of over 20 million hands with known hole cards played at various stakes. So this allows us to determine how effectively we can open particular hands and or hand groups from each position. This s a useful piece of kit which you can use to help you decide if a hand is worth opening from each position. It’s an extra tool that we can add to our poker arsenal. Also included are 3bet, cold calling data, and multi-way data – so it is useful for almost all preflop situations when building poker ranges. 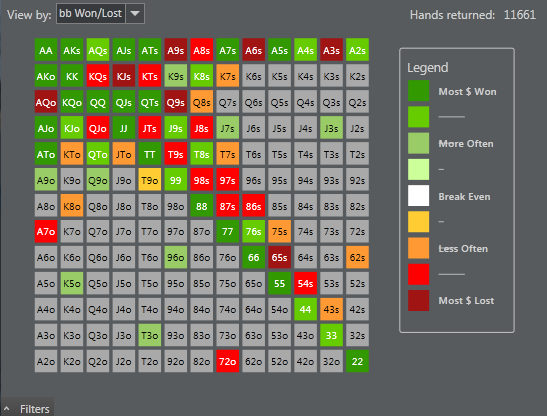 Get your free poker range construction bonus pack (including the free 20 million hand poker database excel sheet)! Thank you for the support! Click here to get your bonus pack. NOTE: If you play 9 max games, these fullring ranges from upswing may come in use. Since we are UTG, we will open a tight range. The reason for this is simple – the more players there are left to act, the more chance we will come across an opponent with a premium hand such as QQ+, AK. Thus in the position where there are five players still to act we should play a narrow range of hands. To find out more see the earlier blog post: Fullring or 6max, which should you play and Position is King. 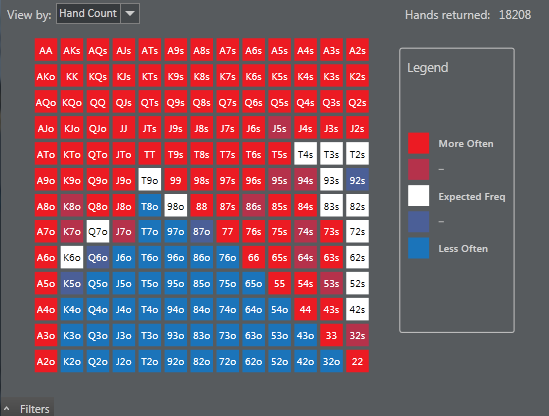 The hands I would typically play are below: All pocket pairs (22+), all suit broadways (ATs+, KTs+, QTs+, JTs+), big off-suit aces (ATo+), small suited aces (A2s-A9s), KQo, medium suited connectors (76s-T9s). The hands I was unsure of when constructing this range was the lower end of the medium suited connectors, KJo and J9s. All of these hands were on the edge of what my experience told me was profitable. In this case, I have decided to leave out KJo and keep in J9s for no better reason than I was once told by a coach that J9s is usually a good open UTG. The first stage in this step is to filter our database for a particular number of hands or time period. I chose last year (2015) where I played 400k hands. This is quite a large sample for what we need – preferably we will want 100k+ hands. Once the filter is in place, you can use the hand chart table to see what hands are most frequently opened and how profitable they are to open. 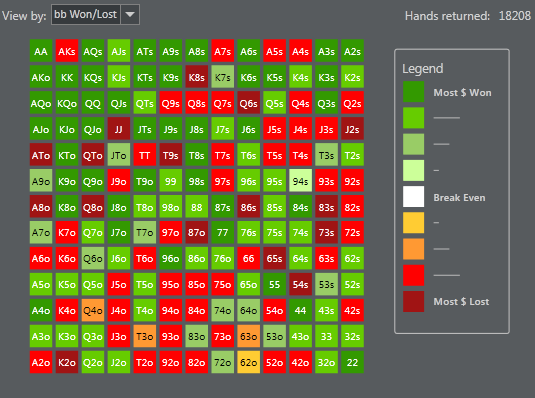 Looking at this table you can see some hands are unprofitable which we know are unprofitable in most cases (e.g. A7o, 54s, 72o – not sure what happened there). There are also some starting hands which seem to be unprofitable which are 100% profitable opens – for example, AQo and KQs. So you have to take this with a ‘grain of salt’. The sample sizes aren’t large enough to get a true value of the bb/100 each hand it is, but it will still be able to use this to adjust our ranges. Are the baby aces always profitable opens? Even a 400k hand sample isn’t the largest dataset. It would be preferable to have something a bit more substantial to compare with when building these ranges. This is where the large database comes in. Halfway there now… let’s keep it going. Next, we can use the 20 million hand database of known hole cards to help determine what the best 6max opening ranges will be. As shown, 98s+ is profitable in this large database, and 87s and below is slightly losing. Also notable is how profitable J9s is: it is more profitable than JTs which doesn’t seem correct. However, it is very unlikely to be unprofitable since it is winning by so much. Hence, it seems the suited connectors are not as profitable as I originally thought from UTG; so we will need to adjust our strategy and open less of the medium suited connectors. Another interesting point is the small Axs. I have always felt that these hands are profitable to open from UTG because they play very well – when you hit an ace high board you can often pot-control and if you hit your straight or flush you can win a big pot. Also, when you open UTG people are often very willing to let go of the pot because you typically have a very strong range. The difference between A2s and A5s is minor, so you can group these hands to get an aggregate win rate. This winrate is positive with the large DB. So we are good to go with all Axs hand types from UTG. Another interesting hand type is the big unsuited broadways. I always open KQo as I think it is profitable from experience. This is confirmed by both my database and the large DB analysis. But KJo is debatable. Both in my DB and the large DB, the win rate is very small, so it is very marginal indeed. In the final opening range, I will remove KJo but make a mental note that if there is any reason to open wider (such as a weak player in the blinds or tight player on the button) we should open it. Also, note that all other off-suit broadways are not profitable in both databases. What about Q9s and K9s? My database says they are profitable opens, but the large database has Q9s and K9s as profitable (+13bb/100) and unprofitable (-30bb/100) respectively. This doesn’t make sense as K9s should perform better than Q9s. This could be due to sample size and the fact K9s is dominated more frequently than Q9s. I would put both of these hand types in the same bracket as the unsuited Broadway KJo – open them if I have a good reason, fold otherwise. All pocket pairs are pretty standard to open. ATo is a standard open too. You should also look at this critically, and not take it as the ‘perfect range’. This range is approximately what is optimal for ME, based on my skill level and the games I am playing (50/100nl zoom at PokerStars). Also, my ranges are always changing and improving as I gain more experience; hence this is a good range to start out with. However, you should look to do this process yourself and come up with a range which suits your play style and games you play in. All Axs can be opened at a standard table. Can be folded, however, if the table is particularly aggressive. KJo can be opened when there is a weak player in the blinds or tight/passive player on the button who won’t attack our open often. J9s is good for an open UTG as a standard, but again should be dropped on bad tables. One thing to note about my button opening range is that it is quite wide. That is because my button open strategy incorporates a lot of min-raising vs. players who I believe will not defend well vs. small opening sizes, or they just do not defend often enough to stop me making an instant profit. Thus I will open small and very wide vs. these players. This may not always be a good strategy depending on the games you play. For the SB, I would typically just use my Button opening range as my standard. But my standard opening range will be for someone who defends well vs. Sb steals; most of whom are few and far between. Therefore my average opening percentage is often up around the 55-60% mark from the small blind. I frequently open more often to exploit an opponent’s weaknesses. The other aspect of small blind play that people fail to consider: with the small blind we already have money invested. So now it is not open a hand if we can profitably open (i.e. win rate> 0bb/100), we should open once the win rate is above the amount we will lose if we folded (i.e. -50bb/100). This means we can play more hands profitably than if it was from other positions. In general, if you don’t feel comfortable playing any of the weaker hands in the range you shouldn’t force yourself. But over time you should widen your ranges as your skill levels increases. The more hands you can play profitably the more money you will make on average in the long run. There is a reason loose aggressive players are the biggest winners when played correctly. This is the player style you should be ultimately striving towards. If you’re playing in a particularly tight game and if you are comfortable, you can widen these ranges further. You should try to play the opposite of your opponents – when your opponents are tight, you should play loose, and if the games are loose you should look to tighten up. It is important always to be adjusting to your opponents as this is the essence of poker: playing the player not a static range of hands. If you currently are playing full ring poker you can still use these ranges; just add on the earlier positions yourself. Building these ranges would be a great exercise for someone who is just starting out. 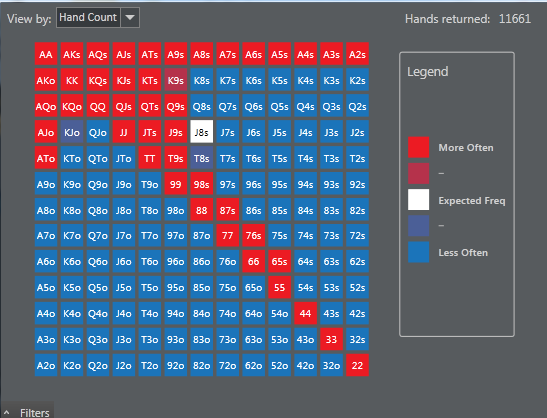 Want to know more about preflop starting ranges? SplitSuit has an excellent guide on building poker ranges which also covers the flop, turn and river. 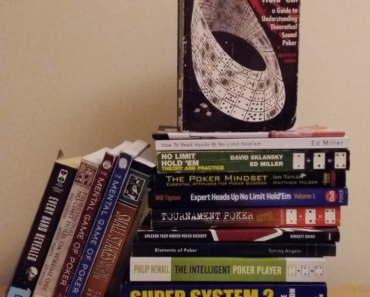 I would also suggest, Mathew Janda’s Applications of No limit Holdem (which I cover in my best poker books post here) which is where I initially got the ideas for this post. I would like to thank Alan Jackson (see: 2+2 and http://ajacksonadvantage.com/) who kindly allowed me to use the large database in this article. If you found this article useful, please comment & share below! There are many advantages of playing poker online. Firstly, you are not supposed to pay any tip if you win the game. It indicates more money in your pocket. 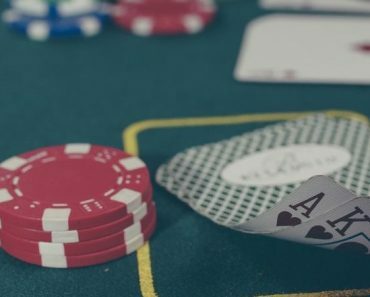 Another main advantage of playing poker online is that it provides you comfort of playing your favorite game right from your place, whether it is your dining room, bedroom or office. All you need an excellent internet speed and a system. Add in the board, then you can assign this preflop range into one or more colored groups. This can be done manually in the hand grid or with the extensive auto-selection tools available. Keep up the good work,impressive job!